Much of my childhood was growing up during World War II when consumer goods were in short supply. Some of our cookware was enamel pans that would often chip and then develop a hole as the underlying metal rusted. I remember that these pots could be repaired with a special kit that would seal two washers over the hole. Post World War II consumer goods began to be manufactured and in the late 40's and early 50's there was a strong push to market high quality stainless steel cookware. The routine was a dinner cooked in the vendors ware at a home hosting a group of guests followed by a pitch by the salesperson to buy their products. Thus my mother attended one of those events and ended up purchasing a full set of pots and pans of various sizes. These goods were of remarkable quality and durability. Upon the passing of my mother I inherited this cooking set. We still use those pots and pans today. In fact this past Monday night we cooked our sweetcorn in water boiling in a large roasting pan from this set. This cookware in use over 60 years still looks almost as good as the day it first appeared in our farm kitchen. So how does this lead to strawberry shortcake? 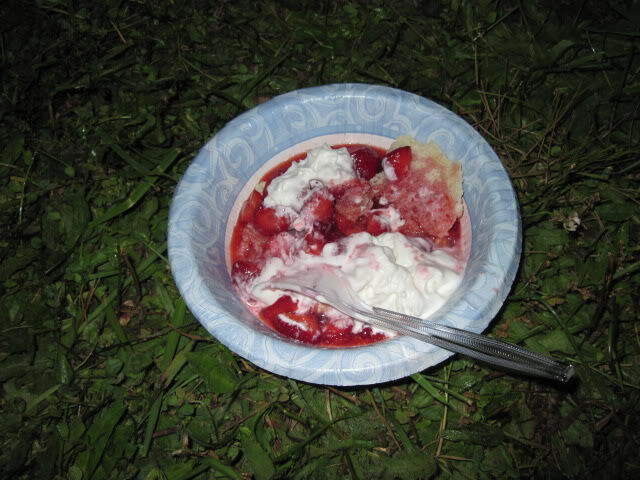 It is tied to my memory of the strawberry shortcake my mother used to make when I was a youth. At a recent dinner out at the Antlers Restaurant I was offered Strawberry shortcake as a dessert. When I quizzed the server about the type of cake used I was told it would be pound cake. I immediately rejected the choice as I recalled the delicious baking powder biscuit my mother used as a base for our desserts. A flaky, warmed biscuit with a slather of butter. On top of this we would pour the cream from our own cows. My dear wife remembered my response and so with our meal on Monday she produced a replica shortcake of my childhood recollection. It was fabulous!! So a dinner of corn on the cob, pots and pans memories and the coup de gras of strawberry shortcake. Life is good!